As an engineer neck deep into AWS thanks to my role at Versent, I could not have been happier to head to AWS re:Invent - one of the largest tech events on the planet. But it was hard to know where to begin, and how to approach the absolute brilliant chaos that is Vegas. Here are my musings of what I loved, liked and would definitely change next time. It's hard to miss the focus AWS has to encourage migration from "on-prem" into "cloud", but there's a subtler theme that can be found inside Vogels' keynote - to encourage developers to challenge defacto and seek a better fit. In his keynote, Werner Vogels, Amazon’s CTO and VP, recounted how a deep-dive analysis of Amazon.com's database usage had discovered how only 10% of queries were relational, and that "the era of using relational databases for everything has come to an end." There was an excellent follow up ‘Chalk Talk’ (unfortunately Chalk Talks are not filmed), where the engineers went through their zero-downtime migration of 150TB of data fromOracle to DynamoDB, and the incredible benefits they found. The moral of this story is that simply migrating "to the cloud" can bring benefits, but really taking advantage of the services available is where the magic lies. On the database front - Andy Jassy, AWS’ CEO, announced three new options, that will take care of even the most niche requirements. AWS relentlessly ships new features, and while this year is no exception, I'm sensing greater focus on additional training wheels. The massive quantity of services and unlimited freedom can leave you paralysed with choice, and I suspect solving this is anew mission for AWS and will continue through 2019. There are a few notable contenders I will talk about. Lambda had two announcements that should excite the developer community - better debugger tooling and the release of Firecracker. Although I haven't had a chance to try, there is now a way to configure your local IDE to a remote debugging session inside Lambda. More exciting is the release of Firecracker- the underlying virtualisation layer behind Lambda. This release isn't impactful yet; but given some time in the hands of the community should yield some very interesting outcomes - including continued improvement on developer experience. This is what I'm most excited about. DeepRacer is an AWS educational tool that helps developers get a taste of machine learning. Under the hood you will find a raft of AWS services, open-source frameworks (and others), but is abstracted away into a fun project for developers. The console is full of "info"bubbles and quick start templates, and the car is pre-configured and ready togo. Other examples to lookout for are Landing Zone and Control Tower. Although only announced and far from complete, they aim to help new comers start with sensible defaults instead of a blank slate. Every day, I attended about five sessions. I learned very quickly that bouncing between venues was next to impossible; instead I stood my ground and packed in as much as I could inside the one venue. Most of these were selected well ahead of time, but I also had loads of success in this year’s walk-up option. Don’t forget to take notes - you will be bombarded with information - I have pages of notes that I still need to distil, but there are so many gems I’ve noted down and will sharing with the team. It was amazing to seethe first keynote in person with thousands of others, nothing beats that atmosphere. 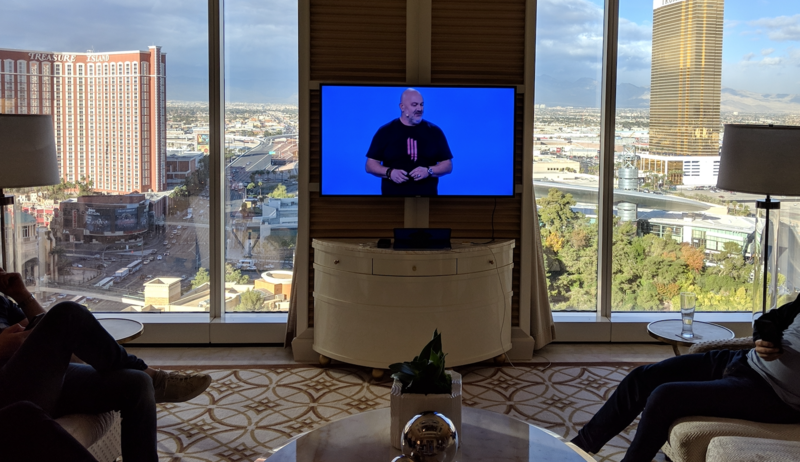 However, after experiencing the first keynote, we skipped the lines and watched the keynotes remotely from the Versent team suite. This meant we could catch up on sleep, relax and have breakfast, then discuss the keynote releases as they were launched with our team, which was really valuable. I am ashamed to admit it, but I missed my very first talk because I underestimated the distance between venues. There really is so much walking involved at re:Invent! I did however discover the Overflow rooms - these were an excellent way to fill in time and catch sessions in remote venues. Oh, and wear running shoes! Would I go back? S**t yes! The Versent family are based all across the country, so it was awesome to meet some of the folks you Slack with on a daily basis, in person. 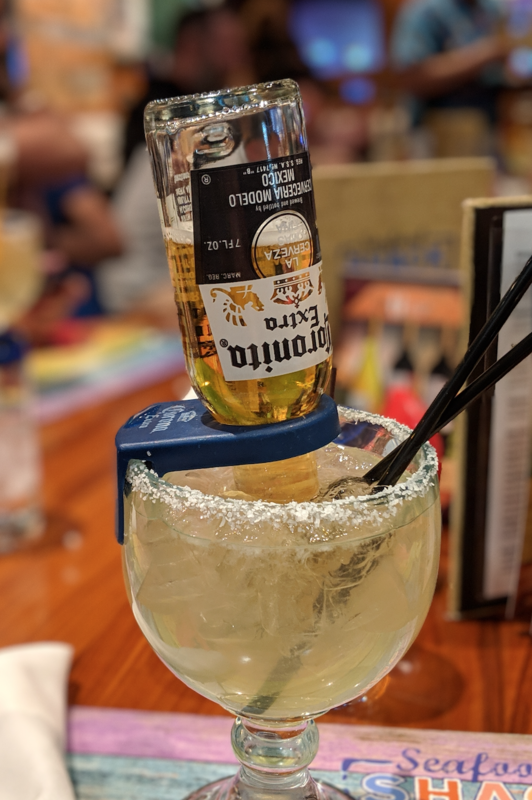 When in Vegas, you must experience the "Coronarita"
Skipping the lines to watch the keynotes from the suite with colleagues was more valuable than sitting quietly in the crowd. 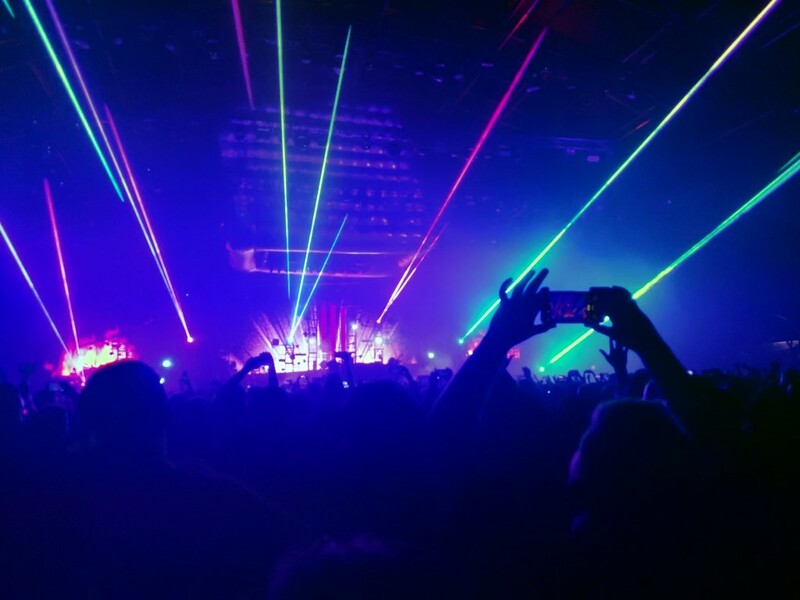 Surrounded by my fellowengineers, this was the most civil mosh pit Skrillex has ever seen!